“We’ve built a solid reputation for delivering beautiful projects and a comfortable, safe experience to our clients and design partners. The article touched on our efforts to leverage that reputation and brand through social media,” said Wright, 39. The magazine feature follows a year of industry accomplishments and awards for the Indianapolis native. In April of 2010, WrightWorks received one national and three regional Contractor of the Year (CotY) awards from the National Association of the Remodeling Industry (NARI). The CotY award-winning projects were built by WrightWorks in the Springmill, Arden, and Forrest Hills neighborhoods of Indianapolis. Following their CotY success, a few months later WrightWorks received two regional Chrysalis Awards. Judged by the editors and writers of consumer publications such as Better Homes & Gardens, Woman’s Day’s Home Remodeling & Makeovers, Southern Living Magazine and Sunset Magazine, the Chrysalis Awards recognize what they believe to be the finest remodeling projects in the nation. In addition to being recognized for his well crafted, beautiful projects, Wright was also named to the 2010 REMODELING Big50 at Remodeling Magazine’s Annual Leadership Conference in May. Since 1986, the Big50 awards have recognized excellence in the remodeling industry. The Big50 selection criteria include standards of financial performance, leadership, service to the industry, service to the local community, and how well companies treat their employees and trade partners. Wright attributes his company’s continued success to fine craftsmanship, partnerships with some of the most talented designers in the country, and a company culture that centers on delivering a comfortable, safe experience to clients and designers at every stage of their remodeling projects. 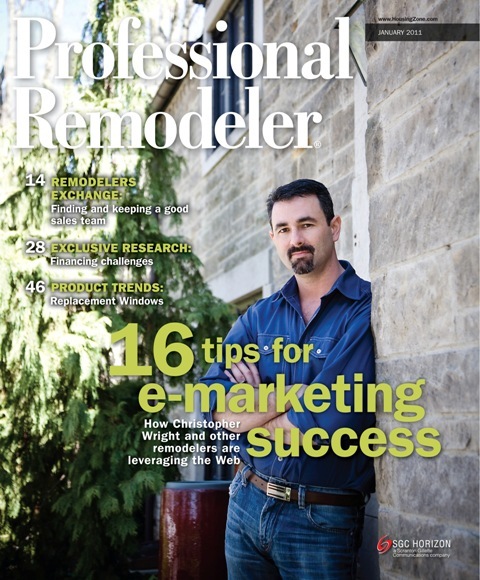 Wright continues to lead the remodeling community into 2011 as president of the Central Indiana Chapter of NARI for the second consecutive year. He also sits on the advisory board of Carmel’s new Indiana Design Center and travels regularly to study and speak at building industry events.